In regard to Neeraj's post I have uploaded this picture which I took a few days ago. It has been taken at the railway track were the three children died under a running train like this on 15th of August what I didn't know when I went there two days ago. Now knowing what happened here just a few days earlier it is even more dramatic as it seems that nothing has been changed. 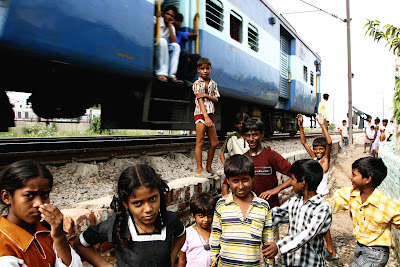 Children are again playing on the railway tracks with their whole families living very close by. How many more have to die before something changes? I seriously doubt anything will change. Thank you for sending your very interesting blog/fotos, which you are updating every day on your web-page. We highly appreciate you contribution in Göttingen about India. The pictures are reality and true representator of every community. 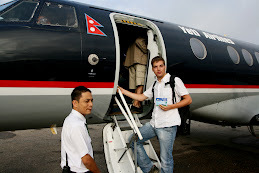 From Delhi to Kathmandu the pictures are very interesting. We would like to get your intention to make some picture regarding the traffic problems in the mega cities of India in which you are always travelling. About this theme we are going to conduct a big conference in November under the title of "The traffic problems in big cities in Asia" taking the cities of Delhi, Mumbai and cities of china as an example. We would be very interested to get your pictures contribution for this event. The pictures of the cities you travel these days, the means of travelling in India, the problems common people face regarding the traffic. and they will continue to..